Earlier this year, Canadian ETF assets surpassed the $100 billion mark for the first time. And although the asset growth has been rapid, ETFs still make up just a small portion of the $1.3 trillion Canadian mutual fund industry. One of the main benefits for using ETFs instead of mutual funds has to do with the fact that the fees, specifically the management expense ratios (MERs), are typically much lower. And with more players entering the ETF market, which is increasing competition and leading to lower and lower fees, the popularity of ETFs will only increase. But does ETFs’ performance match their increased popularity? One gauge might be how they do in Fundata’s annual FundGrade A+ Awards. The results are quite surprising. All else equal, lower MERs translate into better performance results. And better performance should be reflected in higher monthly FundGrade™ Ratings and more FundGrade A+ Awards. This certainly seems to be the case as proportionally, ETFs have received more A+ Awards than their mutual fund counterparts. Since the awards were first established in 2012, on average, over 12% of eligible ETFs have received the award each year. This is well above the overall average of around 5%. And based on early projections, it looks like this percentage could increase for 2016, with around 13% of eligible ETFs in line to earn an A+ Award. 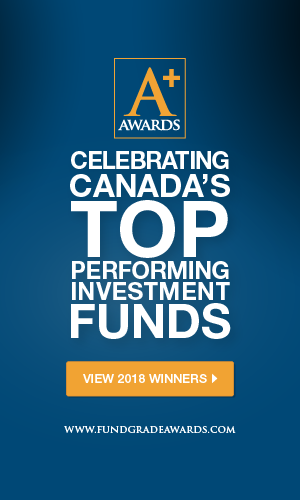 Here’s a look at some of the perennial A+ winning ETFs as well as some of the ETFs that are vying for their first award. But first, it is interesting to note that fixed-income ETFs have performed particularly well against their peers. While the proportion of ETFs that are fixed income is much higher than that of mutual funds (32% vs. 15%), the number of fixed-income ETF A+ winners is still disproportionately higher than it is for mutual funds. Over the past four years, 46% of the ETF award winners were fixed income, whereas for mutual funds the number is closer to 14%. Only two ETFs have managed to win an A+ award in each of the past four years. Both of these are fixed-income ETFs, and both are looking to make it five for five in 2016 by continuing this outstanding performance. The first is iShares Canadian Corporate Bond Index ETF (TSXP: XCB), which tracks the FTSE TMX Canada All Corporate Bond Index. This fund has an MER of just 0.46%, well below the Canadian Fixed Income average MER of 1.26%. It has historically generated above-average performance with below-average volatility, and so far in 2016, that trend has continued. The second ETF to earn four consecutive A+ Awards is the BMO Short Corporate Bond Index ETF (TSX: ZCS). This Canadian Short Term Fixed Income fund tracks the FTSE TMX Canada Short Term Corporate Bond Index. It has an MER of just 0.13%, third lowest in a category where the average is 1%. Since inception, this fund has consistently been one of the top performers among its peers, which more than makes up for its slightly higher-than-average volatility. When looking at projections for the 2016 FundGrade A+ Awards, the U.S. Equity ETFs are the clear standout. BMO is leading the charge in this category with outstanding performance from two rules-based, or “smart beta,” ETFs. BMO Low Volatility U.S. Equity ETF (TSX: ZLU), which is the top-performing U.S. Equity fund over the past three years, selects 100 low-beta stocks from the U.S. large-cap universe. While the BMO U.S. Dividend ETF (TSX: ZDY), the top performer over the past two years, selects dividend payers using growth rates, yields, and payout ratios. These ETFs have MERs of just 0.33% and 0.34%, respectively, compared with the category average of 1.9%. BlackRock also has two ETFs in the running to receive their first A+ Award in 2016. iShares Core S&P 500 Index ETF (TSX: XUS) provides low-cost exposure to the S&P 500 with an MER of just 0.1%. iShares Edge MSCI Minimum Volatility USA Index ETF (TSX: XMU) has a slightly higher MER of 0.34% and tracks the MSCI Minimum Volatility USA Index. The index consists of equities that in aggregate have lower volatility than the broad U.S. market. Both of these funds are top-decile performers over the past three years with below-average volatility. Finally, Vanguard S&P 500 Index ETF (TSX: VFV) also has a chance at earning its first-ever FundGrade A+ Award in 2016. However, it will have to get back to monthly A-Grade status before it can do so. VFV tracks the S&P 500 Index and has the distinction of having the lowest MER in the category, at 0.08%. Brian Bridger, CFA, FRM, is Vice President, Analytics & Data at Fundata Canada Inc. This article is not intended as personalized investment advice. Securities mentioned are not guaranteed, involve risk of loss, and are subject to commissions.